When you buy a digital download here, I email you the files myself (or send a download link) within a day. When you buy a paperback, it's mailed to you directly from Amazon's CreateSpace. I can sell at a discount because I get a discount myself. Sheet music and mp3 files of individual songs available at my YiddishTheaterSongs.com (there's an index of available sheet music including melodies, chords, transliterations, and translations). 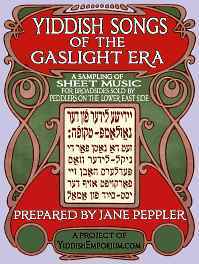 Or click here to buy the paperback directly from Amazon: Yiddish Songs of the Gaslight Era. Purchase as a paperback book directly from Amazon: Yiddish Songs from Warsaw. Buy the spiral-bound Musicians' Edition directly from Lulu.com for $25 plus shipping. 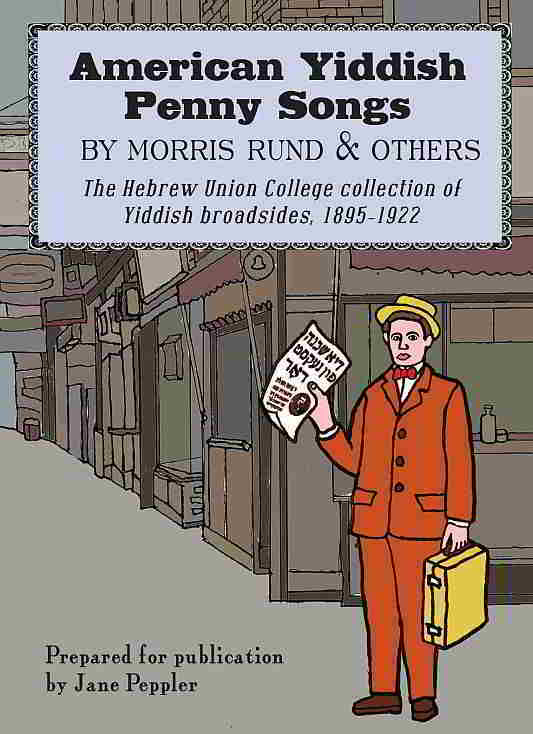 Buy the paperback directly from Amazon: American Yiddish Penny Songs. I Can't Complain (but Sometimes I Still Do) is the companion songbook to Jane Peppler & Aviva Enoch's cd by the same name. All the songs from the cd and sixteen more. Click here for the I Can't Complain table of contents. Buy the paperback directly from Amazon: I Can't Complain But Sometimes I Still Do Songbook. Menakhem Kipnis made two collections of folk songs: 80 folkslider and 40 folkslider. This book contains both, all 140 songs, and has been reindexed. 308 pages. International purchases order here: 140 folks-lider gezamlt fun M. Kipnis at CreateSpace. Buy the paperback directly from Amazon: Menakhem Kipnis 140 Folkslider Songbook. Mordechai Gebirtig is perhaps the most renowned composer of Yiddish songs. Many of his songs, like Margaritkelekh, are now considered to be folk songs, but he was a towering figure in musical life of Warsaw between the wars. International purchases order here: Geklibene lider mit notn at CreateSpace. Buy the paperback directly from Amazon: Geklibene Lider by Mordechai Gebirtig Songbook. 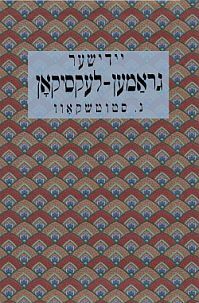 Buy the paperback directly from Amazon: Yiddish Rhyming Dictionary by Nahum Stutchkoff. This multi-year project is finally complete. 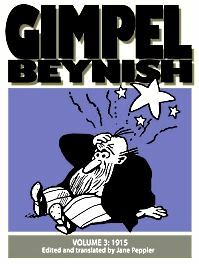 The seven volumes of the series cover the entire run of the Gimpel Beynish comic strip from late 1912 to the last day of Di Warheit publication at the end of February 1919, plus the political cartoons Samuel Zagat drew for the Warheit (Varhayt) Yiddish newspaper. I cleaned them up, translated them, and also retyped all the captions. For the second edition I rewrote the introductions with information new to me since the first edition. You can buy the whole set as a pdf download as well as purchase it in paperback. Click here to read about Samuel Zagat and order any of the seven volumes, as paperbacks or as downloads for only $5 each. I thought it might be useful for learning Yiddish, and for Yiddish book clubs, to have books in pairs: the original Yiddish, and a translation, so you can follow along without having to look up all the words (I did it for you!). You can also email me with criticisms of my translations, a plus! Here's the original Yiddish text for Di alte mayse (The Old Story) by Mendele Moykher Sforim in Yiddish, blown up for legibility so people can have both Yiddish and the translation in hand when they read. 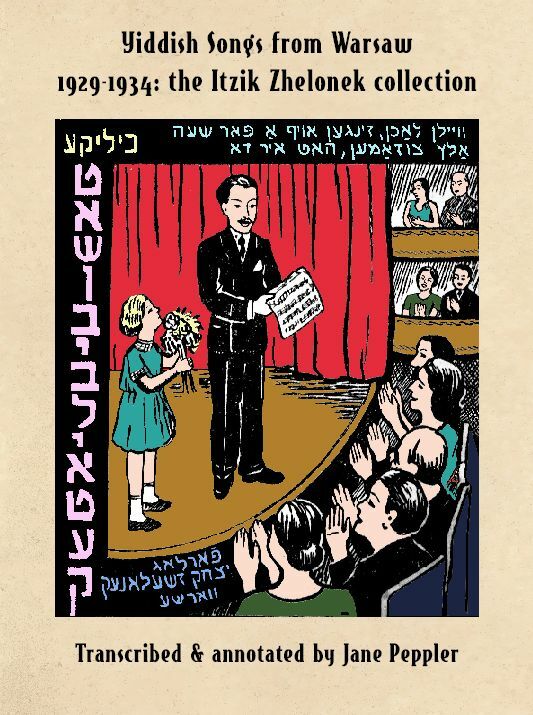 Buy the paperback directly from Amazon: Di alte mayse (Yiddish Edition). Here is my English translation of The Old Story by Mendele Moykher Sforim - you can get it as a digital download or a real paperback (print on demand, I order from Amazon and they ship directly to you). Buy the paperback directly from Amazon: The Old Story by Mendele Moykher-Sforim. A couple of years ago I translated Jacob Dineson's novel "Alter" and here is the original Yiddish, blown up for legibility. It can serve as a companion for people who like having both Yiddish and translation in hand when they read. Here is my translation of Alter, a novel about a young man who seems luckless, then lucky, then... gets what he wants but at a high cost. Buy the paperback directly from Amazon: Alter by Jacob Dineson translated by Jane Peppler. The text in these books is much larger than in the original editions. Our record label is housed at Bandcamp, which allows you to listen to all the songs all the way through before deciding to buy! We have a lot of other cds there too. Skylark Productions at Bandcamp. I am a Yiddish enthusiast living in Chapel Hill, North Carolina and have been writing books and recording cds since the 1980s. 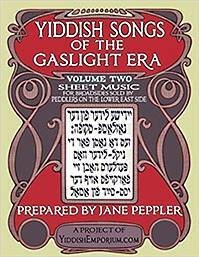 In 2016 I gave a concert and a sing-along of Yiddish songs from interwar Poland at the intensive Yiddish language zumerkurs in Warsaw, and I gave a concert and a sing-along of the Yiddish songs of the Gaslight Era (from the Lower East Side) at the Workmens Circle "Trip to Yiddishland." 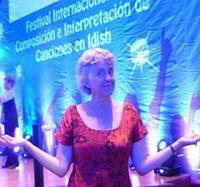 In 2014 and 2015 I gave a lecture/concert on my research at the Library of Congress and at the American Jewish Library Jubilee and the International Association of Yiddish Clubs. I've given concert presentations (all with subtitles on the wall) for the Chicago YIVO / Arbeter Ring community and Yidish-vokh. Also, I won the grand prize in the second annual Der Yidisher Idol Yiddish song writing and performance competition in Mexico City (click the picture to read the Yidish Forverts article about my win!). I perform with the world music ensemble Mappamundi at concerts, workshops, festivals, and weddings. We're always looking for new places to present this wonderful music. See Cabaret Warsaw for information on our Yiddish (and Polish-Jewish) theater music performances. To bring things back from the brink of extinction is my vocation. I have two donkeys, a flock of chickens, two children, one grandson, and a grand-dog.